You may have observed the fantastic gesture controlled Gallery app in Android devices which can zoom in or out on pinching and swipe it left or right changes the currently displayed image. In today's tutorial we're going to build a similar functionality for a TextView. And, we would go further by implementing gesture based responsiveness to other (similar) widgets too. Now, that we have defined our basic behavior and display of the UI, we'll do some more object oriented designing regarding our data. As we are going to use a set of information, it's best to use a custom data object or class in which we define all our attributes/fields and how to handle them. Note: This project uses some custom assets like, Circular Progress Bar. And, third party components like Piotr Adamus's Color Picker and Color Picker Dialog (Made available under Apache License Version 2.0). All asset files and third party files are bundled with the source code available for download at the end of the tutorial, no need to fret. android:text="This is my sample text for pinch zoom demo, you can zoom in and out using pinch zoom, thanks"
Before we go further let's get into the real world issues we need to consider in defining the behavior of the gesture aware TextView, required functionality of the Reader and challenges that come with it. Coordinate Geometry is used in order to fetch and make an understanding of touch inputs. The device's screen is considered a 2 Dimensional coordinate map. Each touch event is registered by returning its corresponding X,Y coordinate on the device. The devices on which your app will run are going to have varied sizes and resolutions. Thus, relative coordinates are used or as in this case, only the difference (called delta by physicists and mathematically inclined people) in the coordinates is enough for determining fling gestures. More details is commented in source code, if you wish to learn more. Implementing Pinch to Zoom & Fling to navigate is a tough combination. The actual events supported by the Android SDK and corresponding touch-events can cause triggering of one another due to the ambiguous nature of our input. There are two solutions to it; Either we can check for the number of touched points at that time to discern the multi-touch pinch and zoom in contrast to the single touch flings. Or, we can provide a toggle switch to the user to activate fling navigation or set the text view font size. Reader Modes are required in order to lock swipe or fling navigation, which can be triggered accidentally while reading. This navigation lock can be provided as a toggle switch on the Action Bar, double tap or even long press and any other ways you can think of. But, such locking mechanisms should be tested well to understand its efficiency in avoiding accidental gestures and navigation interrupting the user's reading experience. I have used three Reader modes - Navigation, Reader and Visibility. The Navigation mode only allows the user to quickly swipe/fling through the Comments. The Reader mode locks fling navigation into place and allows vertical scrolling of Edit Text which replaces the Text View (else use a scroll-able Text View, not implemented here). The Reader mode should be accompanied with a set of navigation buttons to navigate between the Comments without using gestures, which is out of the scope of this tutorial. And, the Visibility mode supports the pinch to zoom feature to setup the font size to a comfortable size and then automatically switch to reader mode after some time. I have used the third party components ColorPicker and ColorPickerDialog from this GitHub repository. It is a very beautiful dialog to let users pick color. I have used this to allow users of the Reader to set the fore-color and the background color as per their taste and ease of reading. The colors of the Reader is editable by invoking the Color Picker Dialog from the drop down menu on the Action Bar. You might want to persist the user set font size and colors in order to save their preferences when they use the app again (Use Shared Preferences. Here's a tutorial - Link). Finally, let's write the Reader's MainActivity defining the gesture listener and behavior of the app. *NAVIGATION - Only detect gestures like swipes in left, right, up and down directions. *Navigation mode allows the user to switch between comments. *READER - Detect gestures to only allow scroll on EditText for very long texts. *avoid accidental touches and altering of current reading experience. * VISIBILITY - Only detect pinch in and pinch out to zoom in or out on text. Comments comment; //Comments data-object. You can use any of your own data objects as per requirement. //Dedicated method to switch colors on text which is set as Spannable Text. if(MODE.equalsIgnoreCase("VISIBILITY")) //check if navigation is on. * onFling happens to be the most important gesture control available. * when the user lifts his/ger finger. * We use this X,Y coordinates for calculating the distance and velocity of fling. * generally of lower velocity. * Adjust the constraints as per your requirement and on device touch experience. * judge the flingMin and velocityMin parameters or even velocityMax and flingMax. * Determining Fling directions and corresponding behavior. * as per the pages of a book. Right to left denotes a page turn or Next_Item. * Left to right denotes a previous page turn or Previous_Item. * from a decent reading experience. * up from the bottom of the screen as per your requirement. //loose his/her place in the list of comments they are reading. 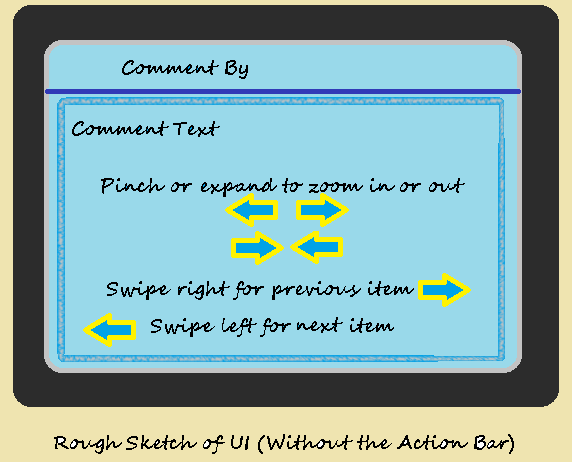 * In the methods below the TextView and the EditText have their UI defined. * exhibit a consistent color scheme as set by the user. * You may want to persist the color settings made by the user using Shared Preferences. * A little bit of coordinate geometry. * Theorem. Distance formula is used to calculate the distance between two points in a coordinate space. * and flat the 2D Distance Equation is used. * The ColorPicker and ColorPickerDialog. *and reader mode switching behavior. *Circular/Ring progress bar is discussed in this tutorial on my personal blog, being         *trivial to the scope of Coder's Hub. Download project source code and sample apk from here.